A Kraken’ Book – Shaun Micallef Online! While Mad As Hell is on hiatus, the team behind the show are busy working on other projects. You may have seen Emily Tahini on Open Slather on Foxtel (with writer Tony Moclair involved in a few episodes), and Francis is of course filming The Ex-PM with Shaun. 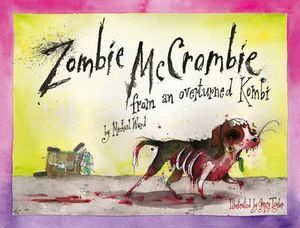 Michael Ward, writer on the show and resident Kraken, has written a book: “Zombie McCrombie from an overturned Kombi”. It’s an illustrated story of Zombie and his zombie dog pals, who roam the empty streets, sniffing the wind for bones they might gnaw on. Firmly tongue in cheek, it’s sure to suit fans of Shaun’s style of humour. Read all about it and get a copy through the website.